A STAFF member at a Shoreham burger bar was held at gunpoint and ordered to hand over cash by two masked men. 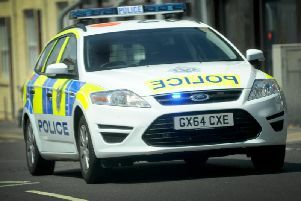 Sussex Police is investigating the attempted robbery at Uncle Sams fast food outlet in Upper Shoreham Road, Shoreham, that took place last month. A counter assistant was threatened with what appeared to be a handgun at around 9.40pm on February 22 as staff were preparing to close. Two white men, both wearing hoodies and balaclavas or ski-masks over their faces, and both around six feet tall demanded cash from an assistant at the till while pointing the pistol at him, according to police. The assistant refused and the suspects fled empty-handed, possibly driving off in a dark car. No one was hurt. Anyone who saw the robbery or noticed the suspects, or who has other information, is asked to email 101@sussex.pnn.police.uk or phone 101, quoting serial 1252 of 22/02.